Neighbors building wealth strengthens our community! 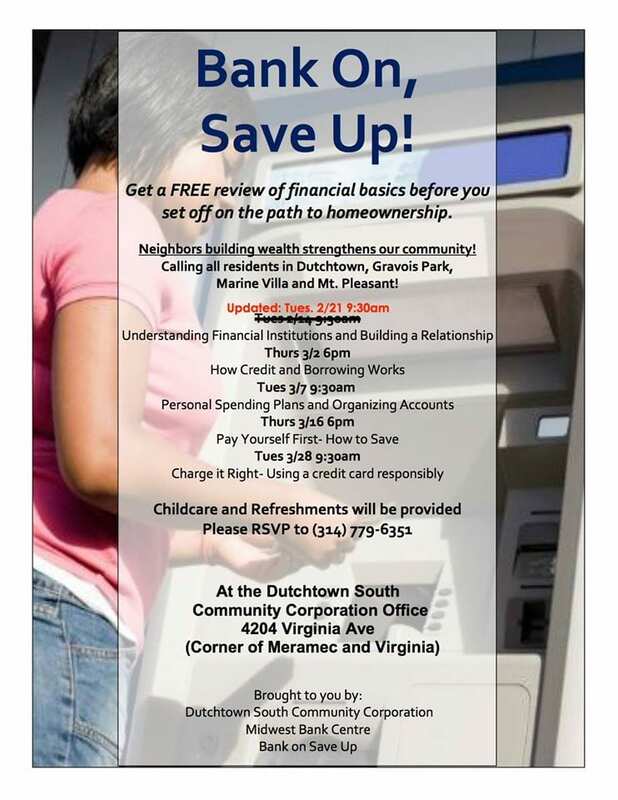 The Dutchtown South Community Corporation is teaming up with Midwest Bankcentre through the Bank On, Save Up program to offer financial empowerment classes at our office at Meramec and Virginia. We want to help neighbors on the path to posterity, wealth building and homeownership within our community. Check out the dates and session topics on the flyer above. Child care and refreshments will be provided. Please RSVP to 314-779-6351. Click here to see all Bank On, Save Up events on the DutchtownSTL.org calendar. Read more news about Classes, Dutchtown, Gravois Park, Marine Villa, and Mount Pleasant.